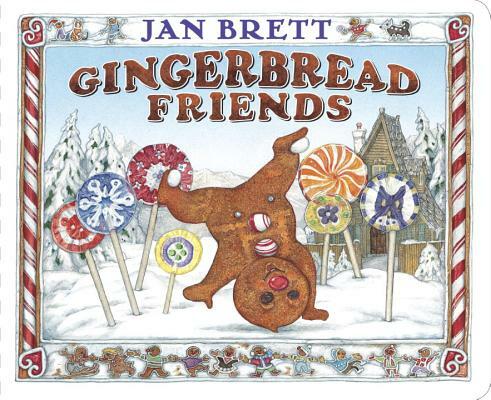 Jan Brett's popular winter tale--now in board book! Confident and excited to make new friends, the Gingerbread Baby happens upon a bakery, where he dances and prances in front of a sugar cookie girl, trying to make friends. But she just stares and doesn’t say a word, like all the other sweet treats he tries to meet. Discouraged, the Gingerbread Baby runs home, chased by a long line of hungry creatures, where Mattie has a fantastic surprise for him--gingerbread friends that fill a giant fold-out page. Jan Brett lives in a Seacoast town in Massachusetts close to where she grew up. She has over 40 million books in print and takes extensive research trips all over the world to craft the intricate details in her books. Her life-like illustrations of animals, landscapes, and cultural flourishes are adored for their classic beauty. Other fascinating areas of her life include being: an award-winning breeder of ornamental fowl (fancy chickens! ), a 12-time Boston Marathon runner; and a member of the Boston Symphony Orchestra Board of Trustees.